Using a function on an Indexed Column in the WHERE clause leads to an Index/Table Scan instead of an Index Seek. 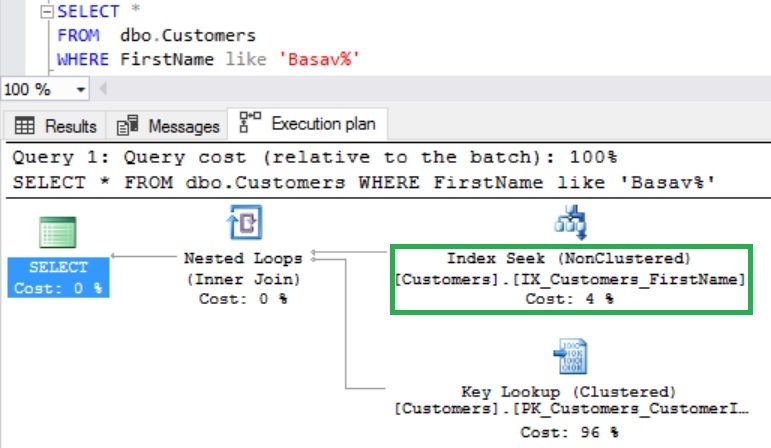 This issue occurs in majority of the scenarios, but in some cases Sql Server does Index Seek even when you are using function on an indexed column in the WHERE clause. Let us understand how using function on an Indexed Column in the WHERE clause results in the performance issue with an example. 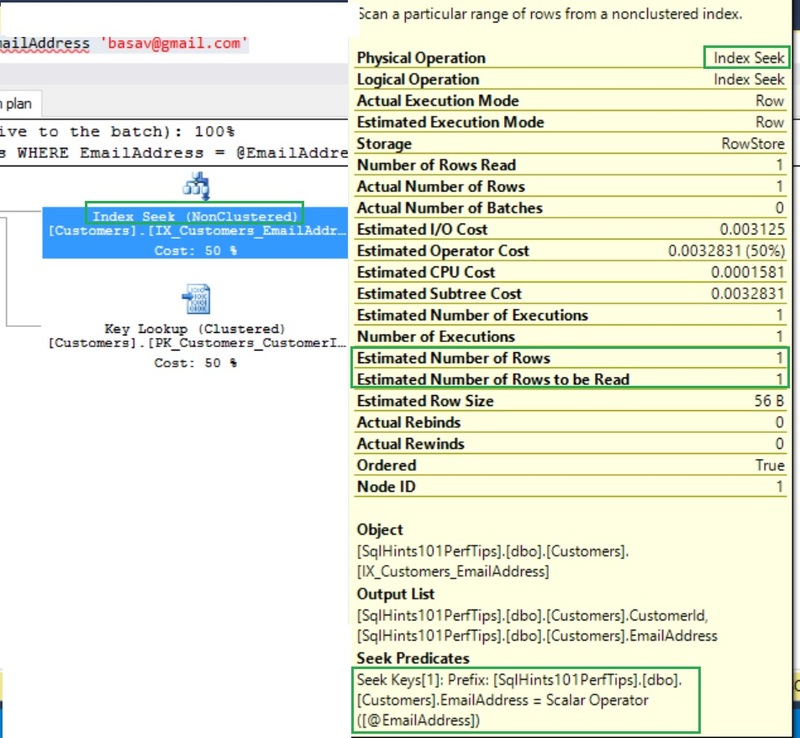 Let us create a Customer table as shown in the below image with sample one million records by executing the following script. 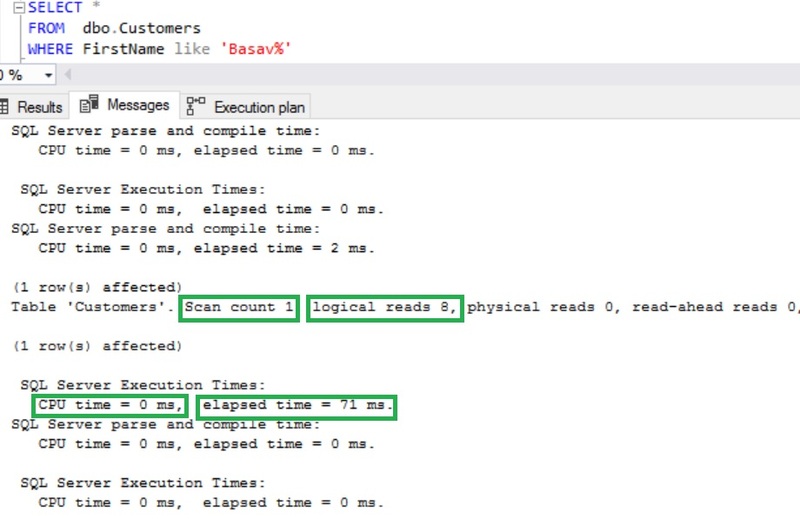 Let us execute the above query and observe the result, execution plan and IO and Time Statistics. Let us go to the Execution Plan tab of the result and see the execution plan. In the node properties we can clearly see that index IX_Customers_FirstName on FirstName column is used but it is doing an index scan, because of this we can see Number of Rows Read as one million records. Let us go to Messages tab of the result and go over the IO and TIME statistics. Using function on the Index column in the where caluse causes the function to be evaluated against each row and thus forcing optimizer not to use the Index. One solution in this case is to re-write the query using LIKE clause as below instead of using the LEFT function. From the above result we can see that there is no change in the result returned from the re-written query. In the properties pop-up now we see the seek of the index IX_Customers_FirstName on FirstName column and also Number of Rows Read has reduced from one million rows to one row. 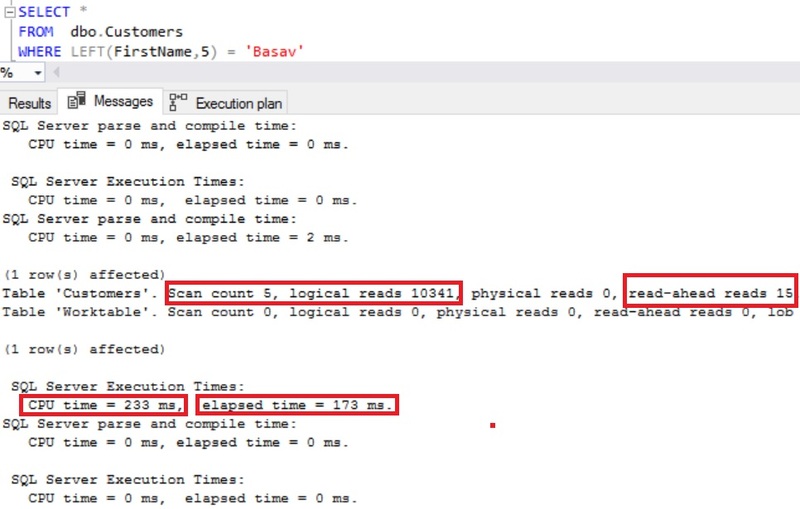 We can see that Logical reads have been reduced from 10341 to 8, CPU time has been reduced from 233 millseconds to 0 milliseconds and query elapsed time has reduced from 173 milliseconds to 71 milliseconds. 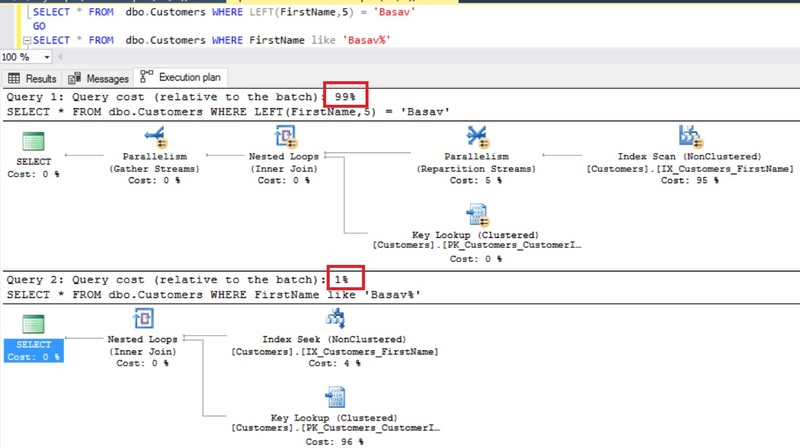 In Sql Server in majority of the scenario using a function on an Indexed Column in the WHERE caluse leads to an Index/Table Scan instead of an Index Seek. If you are using function on an index column in the WHERE clause, verify the execution plan and if it is resulting in un-desired results then try to re-write the query without using the function on a Index Column in the WHERE clause. 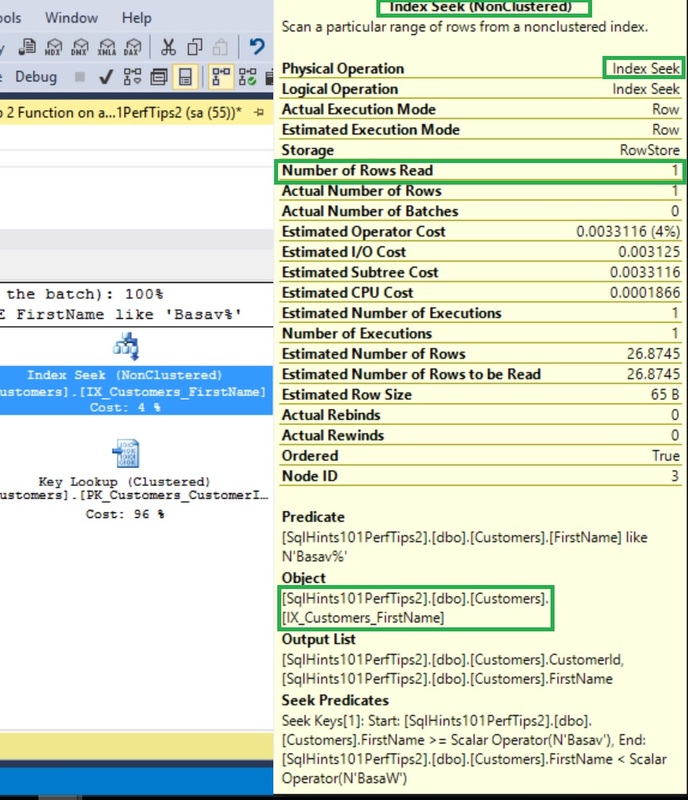 In Sql Server when we compare a column of lower data type to a value of higher data type, then it leads to an implicit conversion of the column of lower data type to the type of the value which we are comparing. This implicit conversion will result in Index Scan instead of an Index Seek and resulting in performance issue. This is one of the very common mistake resulting in performance bottleneck. Let us understand how the implicit conversion results in a performance issue with an example. Let us create a Customer table as shown in the below image with sample one million records by executing the following script. Let us now execute the stored procedure GetCustomerDetailsByEmailAddress to return the details for the customer whose email address is basav@gmail.com. 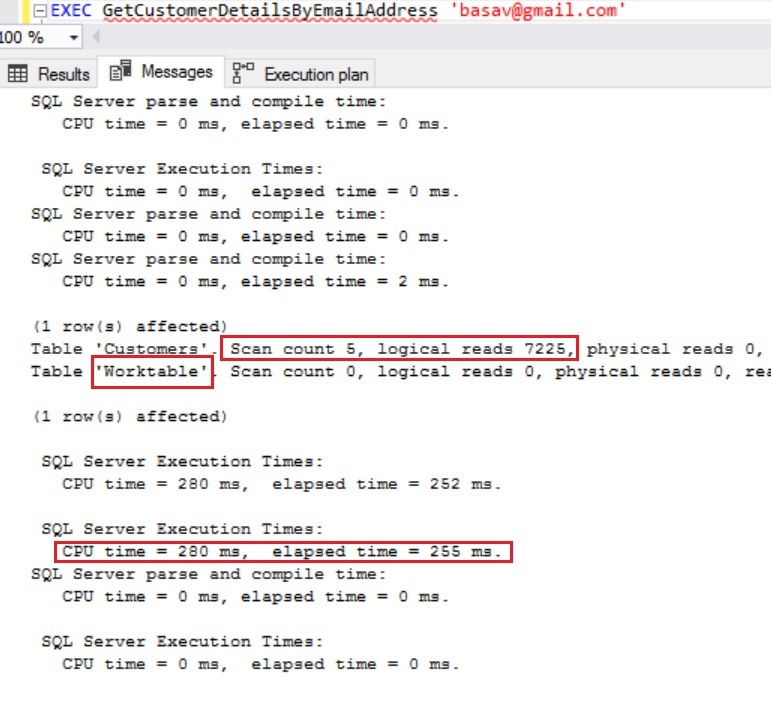 From the above execution plan, we can see that the index IX_Customers_EmailAddress on EmailAddress column is used, but it is doing an Index Scan instead of Index Seek. 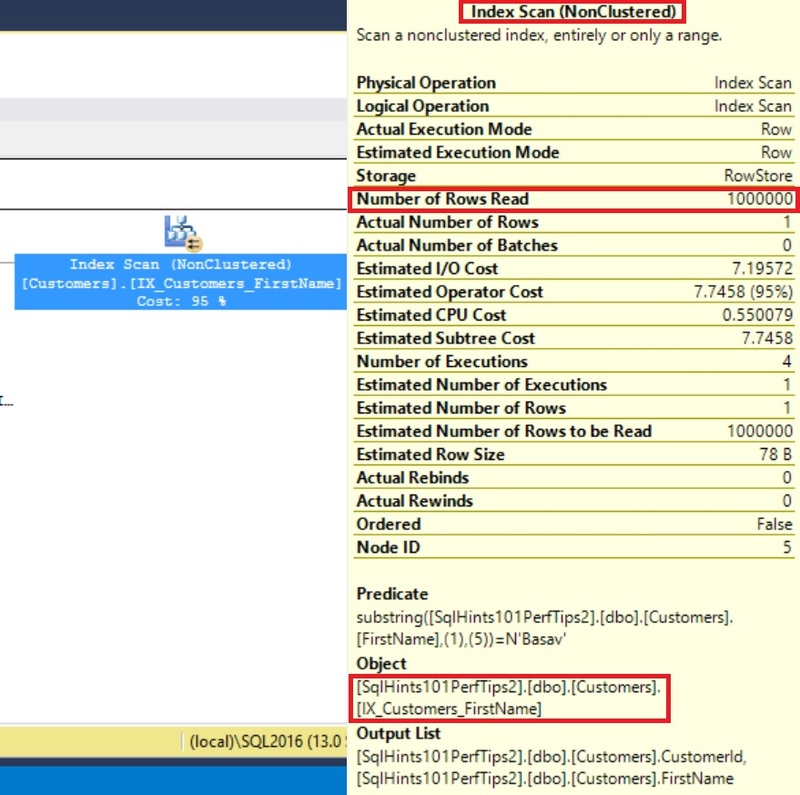 Let us hover over the Index Scan node in the execution plan and and observe the node properties. 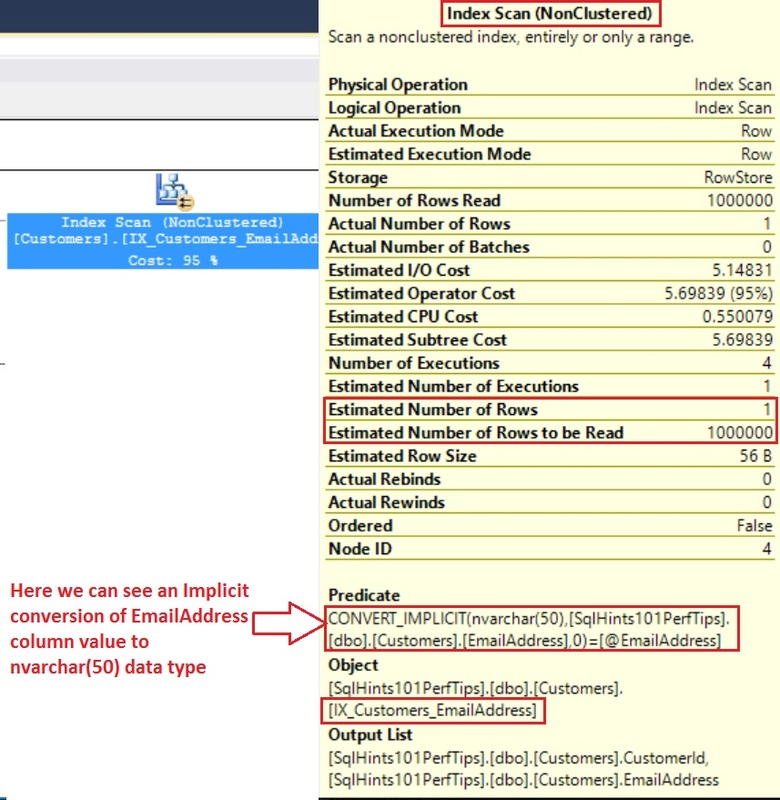 In the node properties we can clearly see an implicit conversion of the EmailAddress column of the Customers table to NVARCHAR(50) data type and scan of the Index IX_Customers_EmailAddress on the EmailAddress column. From the above result we can see that there is no change in from the data returned by the SP. 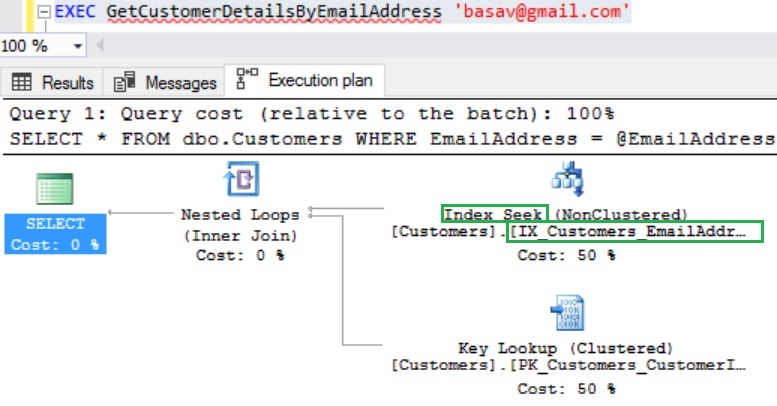 Now from the execution plan we can see that it is doing the Index Seek of the non-clustered index IX_Customers_EmailAddress on the EmailAddress column. Also the execution plan is very simplified and un-necessary parallelism and other overheads are no-longer present. In the properties pop-up now we don’t see any implicit conversion and also Estimated number of rows to read also changed from one million to one. 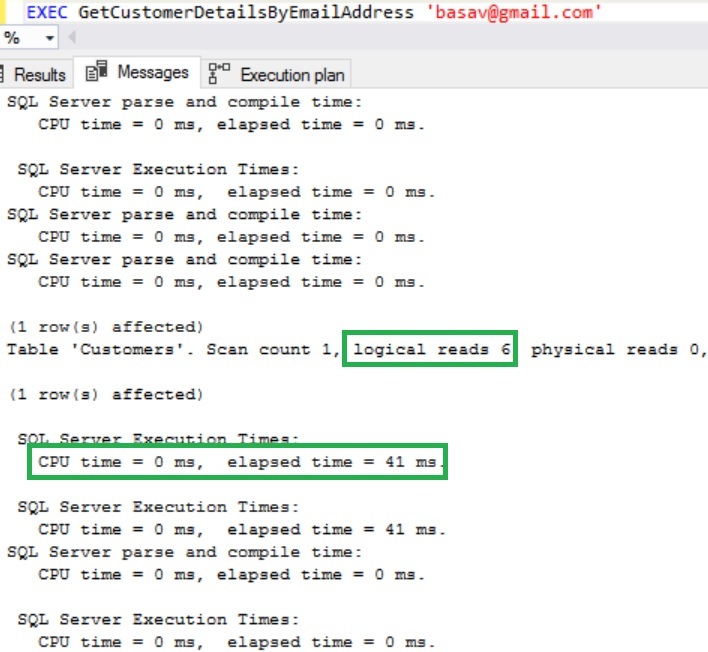 We can see that Logical reads have been reduced from 7225 to 6 and also CPU time has been reduced from 280 millseconds to 0 milliseconds. And also we don’t see the use of the WorkTable. In Sql Server when we compare a column of lower data type to a value of higher data type it leads to an implicit conversion of the column of lower data type to the type of the value which we are comparing. This implicit conversion will result in Index Scan instead of an Index Seek and resulting in performance issue. To avoid such performance issues, we should always make sure that the type of parameter and table column type should always match.